The Jats are immersed in several ethnic groups who retain an identity often based on occupation and heritage. The word "Jat" is from the Arabic word "jatta" referring to the inhabitants of what is now much of Pakistan and Northwest India. In general, they were among the martial peoples of South Asia who eventually obtained land. They are noted for their abilities to make the land productive and to gain a good harvest. Some have moved from farming into urban jobs during the 20th century. 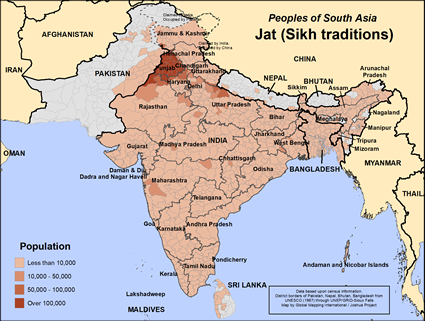 Jats can be Hindu, Muslim, or Sikh, and their origins are in India and Pakistan. Sikhs are a small minority in Bangladesh, a country far to the east of the origin of this Punjabi-based religion. Sikhism first came to what is now Bangladesh in the early 1500s when disciples of Sikhism's founder, Guru Nanak, came to this land. The early converts were Bengalis, but later other Sikhs came to Bangladesh from India, including Jat Sikhs. The few Jat Sikhs in Bangladesh are in Dhaka, Sylhet, and Chittigong. The Jat Sikhs in Bangladesh are usually temporary residents from India though some live in that country. These people are either businessmen or deputies for Indian government agencies. Their places of worship called gurdwaras are almost all in a state of decay, since the number of Sikhs are so few in Bangladesh. Most Sikhs in Bangladesh do not attend worship services at the gurdwaras. Sikhism is a noble religion based on the equality of mankind regardless of their religion, caste, or ethnicity. They believe in one supreme God, though they have incorporated beliefs from Hinduism. The Jat Sikhs in Bangladesh are not a poor group of people at all. But spiritually they lack having the chance to sit at Jesus' feet. They lack a relationship with the one who holds all power in heaven and earth (Matt. 28:18). * Ask the Lord to call people who are willing to go to Bangladesh and share Christ with Jat Sikhs. * Ask the Lord to raise up a disciple making movement among Jat Sikhs for the glory of His name. 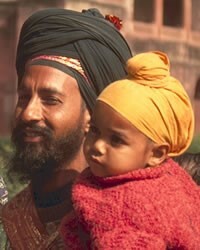 http://en.banglapedia.org/index.php?title=Sikhs,_TheView Jat (Sikh traditions) in all countries.